Waterford, CT (Revised March 25, 2019) – The Southeast Connecticut World Affairs Council (SECWAC) announced today that Stephen Walt is to speak on “America’s Foreign Policy Elite and the Decline of U.S. Primacy” at 6:00 p.m. on Thursday, April 25 at The First Congregational Church of Old Lyme at 2 Ferry Road, Old Lyme, CT 06371. Members and guests are encouraged to RSVP via online registration, but walk-ins will be accepted. In 1992, the United States stood at the pinnacle of world power, and Americans were confident that a new era of peace and prosperity was at hand. Twenty-five years later, those hopes have been dashed. Relations with Russia and China have soured, the European Union is wobbling, nationalism and populism are on the rise, and the U.S. is stuck in costly and pointless wars that have undermined its influence around the world. The root of this dismal record, Stephen Walt argues in his new book “The Hell of Good Intentions” (signed copies of which will be available for sale after the presentation), is the foreign policy establishment’s stubborn commitment to a strategy of “Liberal Hegemony”. Walt argues for a return to the realist strategy of “Offshore Balancing”, which eschews regime change, nation-building, and other forms of global social engineering. A reception will begin at 5:30 p.m., with the main event beginning at 6:00 p.m. The presentation is a part of the SECWAC 2018-2019 Speaker Series. For non-members, tickets ($20) may be purchased at the door; ticket cost can subsequently be applied towards a SECWAC membership. Attendance is free for SECWAC members (and their guests). Pro-rated half-year membership was introduced in February; half-year membership February through June 2019 is $37.50; $12.50 for young professionals under 35; free for area college and high school students. Immediately following the presentation, attendees have the option for $35 of attending a dinner with the speaker at The Old Lyme Country Club. Dinner reservations are required by the morning of Tuesday, April 23, via pre-registration and making a payment securely online, calling 860-912-5718, or emailing info@secwac.org (vegetarian option available if reserved in advance). Stephen M. Walt is Robert and Renée Belfer Professor of International Affairs at the Harvard Kennedy School. He is a contributing editor at Foreign Policy, co-editor of the Cornell Studies in Security Affairs, and was elected a Fellow of the American Academy of Arts and Sciences in May 2005. He received the International Studies Association’s Distinguished Senior Scholar award in 2014. His writings include The Origins of Alliances (1987), Revolution and War (1996), Taming American Power: The Global Response to U.S. Primacy, and The Israel Lobby and U.S. Foreign Policy (co-authored with John J. Mearsheimer, 2007). His latest book is The Hell of Good Intentions: America’s Foreign Policy Elite and the Decline of U.S. Primacy (2018). 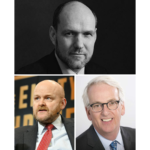 CALENDAR LISTING: Southeast Connecticut World Affairs Council (SECWAC) presents ‘America’s Foreign Policy Elite and the Decline of U.S. Primacy’ with Stephen Walt on Thursday, April 25, 2019, 6:00 p.m. at The First Congregational Church of Old Lyme at 2 Ferry Road, Old Lyme, CT 06371. Free for members. Pro-rated half-year membership (February through June 2019) is $37.50; $12.50 for young professionals under 35, and free for area students. RSVP or purchase tickets online. More information at http://secwac.org.